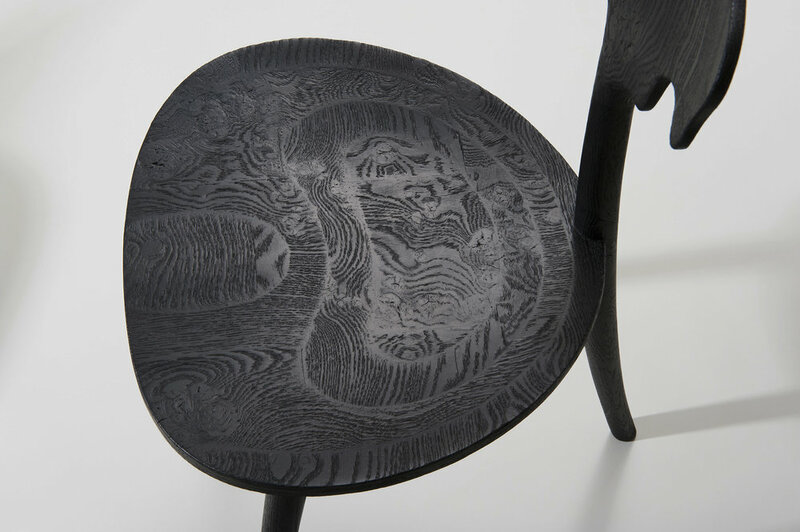 The gallery is delighted that John Makepeace, the godfather of British wood furniture design, has produced a series of unique, handcrafted chairs especially for the gallery; Trine Chair, 2017. Oak. W 45 x D 48 x H 80 cm. Makepeace gained respect as a furniture maker early on; in 1972 he became a founding member of the Crafts Council UK, and from 1987–91 was a trustee of the Victoria and Albert Museum, London. In 1976, Makepeace set up the acclaimed Parnham College for furniture designers and in 1982 he initiated Hooke Park as a School for Woodland Industries and Forestry Management. He was awarded an OBE in 1988 for his services to furniture design and in 2004, he received a Lifetime Achievement Award from the American Furniture Society. In 2012, his work was included in the major Victoria and Albert Museum exhibition British Design 1948–2012: Innovation in the Modern Age. He is the Winner of the Prince Philip Designers Prize 2016.